This is a simple age calculator that calculates your age down to the second. The age calculator should be relatively self-explanatory, just enter your birthdate into the tool. You can also enter the time of birth (if you want to), otherwise it will assume you were born at midnight. There are two options for viewing your “age”. The first (“Numerical Age“) is a table that shows the number of years, months, days, hours, minutes and seconds since you were born. It also shows how long it will be until your next birthday. You can also use the Start Clock button to see your age change each second. The second (“Graphical age“) is a figure that shows your age in the context of a 90 year lifespan. 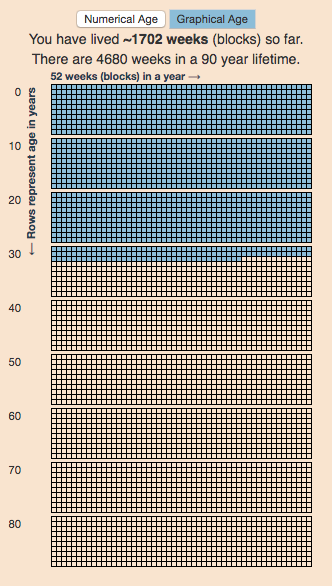 Each block shown is one week and there are 52 weeks (blocks) in a year (row) and 10 years (rows) per decade (group of blocks). This visualization is based on the the very interesting Wait But Why post “Your Life in Weeks” by Tim Urban. It’s a bit humbling to see your life laid out in this way, and to think about how you will spend the (hopefully many) remaining weeks of your life. You can click the URL button to create a URL that is based on the your birthday (so you don’t have to type it in again). Just copy the URL in the address bar at the top of your browser (after pressing the button) to share with others. There was lots of interest in the calculator to estimate counting time (in English) to one million, one billion and up to one trillion. I decided to do the same for other popular languages (Spanish). Here is the calculator that will calculate how long it takes to count to one million (or larger numbers) in Spanish. If you’d like to see this in Spanish click here. Updated: Lots of folks on Reddit pointed out some mistakes in the Spanish calculations, and helped me figure out the solutions, so the Spanish graphs are now updated. The Spanish calculator is now live! Building off of the last post about Counting to One Million in English, I received some comments about looking at other languages. That seemed like a very good idea, so I looked at a list of the world’s most popular languages and saw Chinese and Spanish listed with English in the Top 3. Having a little experience with both of those, I set out to compare how long it’d take to count in each of these languages, if you had to pronounce every single number from one to one million. 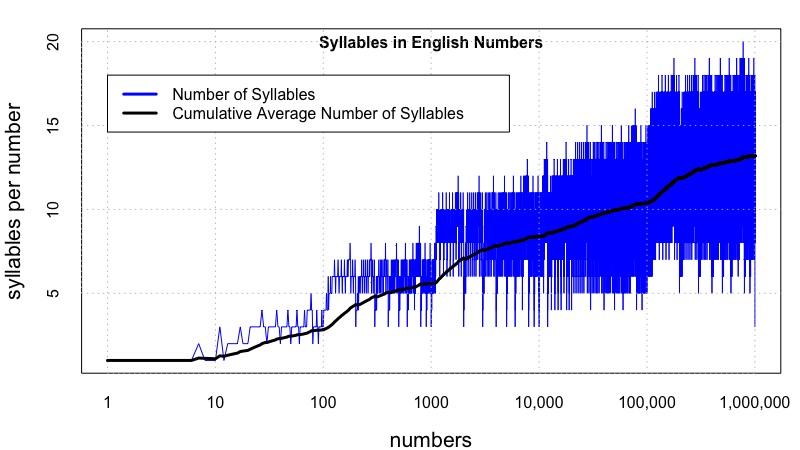 Again, here’s the plot of the number of syllables per number for English. The longest word is seven hundred seventy seven thousand seven hundred seventy seven (20 syllables).